It's not quite a "Bat-Console" but it's probably as close as you're going to get. 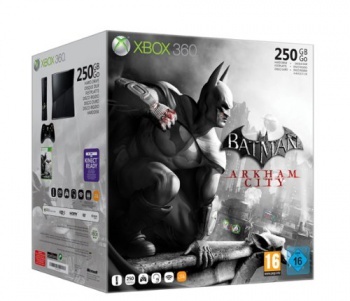 If you're looking forward to Batman: Arkham City and you're also in the market for a new Xbox 360, then you're in luck: A listing on the German version of Amazon has revealed the existence of a Arkham City bundle that brings the two together. The bundle contains an Xbox 360 Slim with a 250 GB hard drive, a black controller, a headset, and a copy of the game. Sadly, unlike the recent Gears of War 3 and Modern Warfare 3 bundles, the console does not have any branding. The bundle costs €280, or around $380, although if it does come to the US it's likely to be a little cheaper than that: the branded bundles cost $400, and they have an extra controller, a bigger hard drive, and tweaks like custom sounds when you open the disc tray. We've contacted Microsoft about whether this bundle will be available in territories other than Germany and will update if and when we hear anything back.